Columbus, Ind. 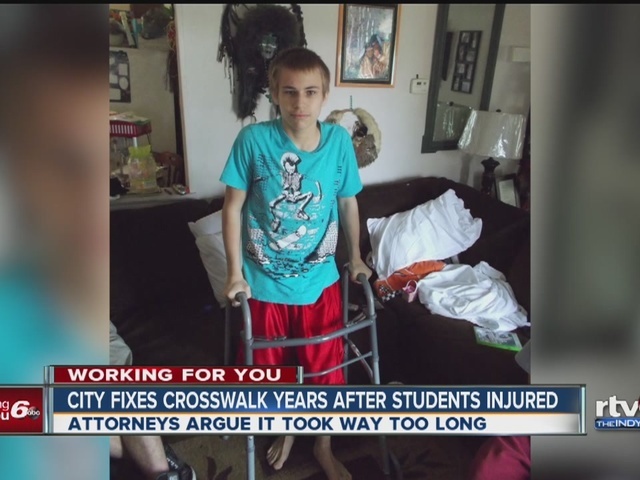 -- Improvements are nearly complete to a crosswalk where two students were hit and injured in separate incidents, but attorneys argue the City of Columbus was too slow to take action. Taylor Chitty, a junior at Columbus East High School, was hit in the crosswalk on Marr Road in 2011, records show. Jalen Lee, who was 13 years old at the time, was hit in the same crosswalk by a pick-up truck in 2013. Lee was rushed to Riley Hospital for a broken leg, six broken ribs, a punctured lung and a lacerated spleen, according to his attorney John Shean, and still has a rod in his leg as a result of the incident. Lee’s attorneys filed a lawsuit in January 2015 accusing the city and Bartholomew Consolidated School Corporation of negligence and alleging they should have taken steps to make the crosswalk safer. The city identified the crosswalk as “one of the most dangerous” in the city as early as 2009, Shean said. Court documents obtained by Call 6 Investigates show in 2012 INDOT approved $438,750 in federal funds, and $48,750 in city funds for pedestrian crossing improvements, including Marr Road. Attorneys for Lee have questioned why the crosswalk improvements are still not finished four years later. The Marr Road crosswalk improvements were supposed to be completed by Fall 2013, Shean said. Call 6 Investigates reached out to city engineer David Hayward, who declined to be interviewed on camera, but admitted the project is taking longer than anticipated. Attorneys for Lee said bureaucratic red tape has been blamed for multiple delays with the crosswalk improvements. Improvements completed include new signage, pavement markings, and flashing warning lights that are activated by pedestrians. On July 15, a Bartholomew County Circuit Court judge threw out Lee’s lawsuit against the city and school district, saying he was at least somewhat at fault for his own injuries. Lee was wearing black hooded sweatshirt and chose to cross the street as the truck approached, court records show. In Indiana, a lawsuit can be thrown out involving a government entity if the injured person is even 1% at fault for their injuries. In comparison, private citizens can be held liable for the percentage of their fault even if the injured person is somewhat negligent. “This order shows the complete unfairness of the law that favors the government,” said Shean. Shean filed a notice of appeal on August 16. Call 6 Investigates left a message for the superintendent of the Bartholomew Consolidated School Corporation.